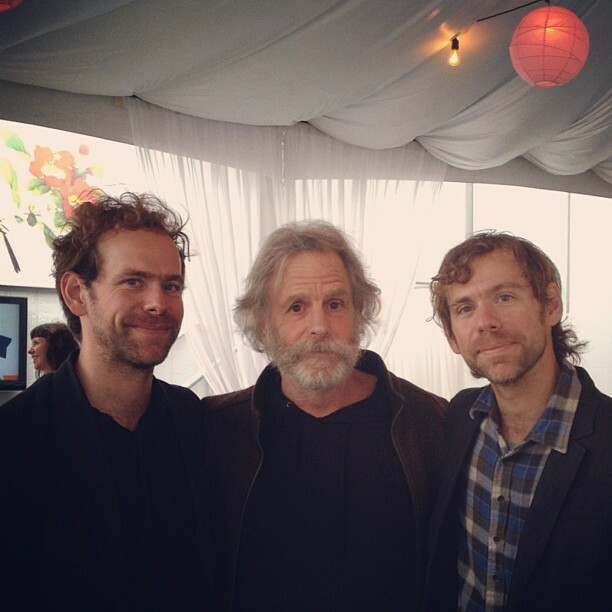 Legend has it the first time the Dessner brothers played with their future National bandmate Bryan Devendorf they jammed for eight hours on The Grateful Dead’s “Eyes of the World.” They were in their early teens. We’re just figuring that out right now. Matt [Berninger, frontman] has got to sing it, so we’re thinking a Phil [Lesh] song, ‘Box of Rain’ or ‘Unbroken Chain,’ something like that. For us, the frontrunner right now is ‘Box of Rain’ I think, but we’ll see. I think Steve Reich is on it as far as doing some things. He’s actually an old friend of Phil Lesh. They go back to younger days. Then there are newer, folky bands like Fleet Foxes, Bon Iver that are interested. Aaron also confirmed the involvement of members of Vampire Weekend, The War on Drugs, Bon Iver, The Walkmen and Kurt Vile. I definitely think that the long-form kind of jam thing that The Dead explored so deeply — and also the way that people got into that, there’s a complexity in their music, especially say with the way Jerry Garcia plays guitar — that absolutely it has some correlation with more composed concert music. 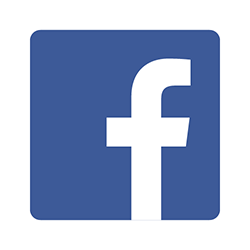 The repetition of the minimalists — I think there’s a certain kind of modal behavior in the way they use scales and things that would maybe would have some relation. One thing that we’re looking at with this idea of doing a Dead tribute is just sort of examining who are unlikely fans of The Dead, and one person I would say is a composer name David Lang is a really important kind of post-minimalist composer — he won the Pultizer prize a couple of years ago — he’s like a massive Dead fan. “The wheels are in motion and a lot of songs from different people have been coming in and they are all lots of closet Dead fans out there in the indie rock world. So, yeah, I think it’s going to be a really cool record. In part the compilation summarizes the state of Dead songs covered live by bands not necessarily expected to do so. The War on Drugs cover “Touch of Grey” on the tribute for instance, as they have in concert. The night Bob Weir sat in with Wilco during 2013’s Americanarama tour stop at Shoreline Amphitheatre is on the comp, as are Real Estate, who covered “He’s Gone” at the Fillmore in San Francisco on Jerry Garcia’s birthday in August 2014. Likewise The National covered “Peggy-O” at last year’s Treasure Island for Bob Weir’s birthday. Tracking at Dreamland with members of The National and friends. What a great room to record in! Can't believe we got to record grateful dead songs with @leeranaldo thank you!! The tracks labeled “…and friends” feature the core band – the two pairs of brothers from The National, Sam Cohen, Josh Kaufman, Walter Martin and Conrad Doucette. 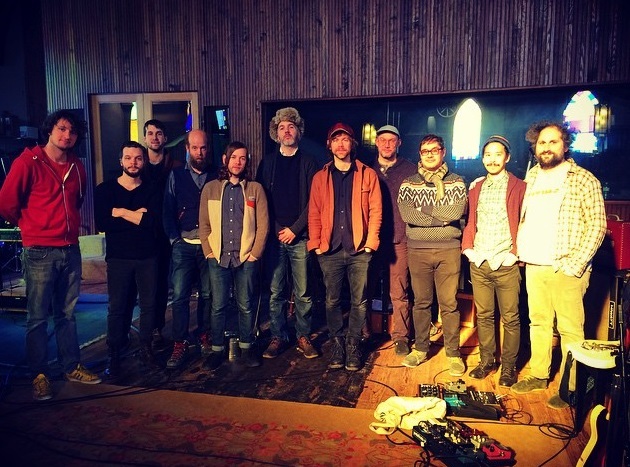 The National teamed with members of Grizzly Bear for a very special selection. 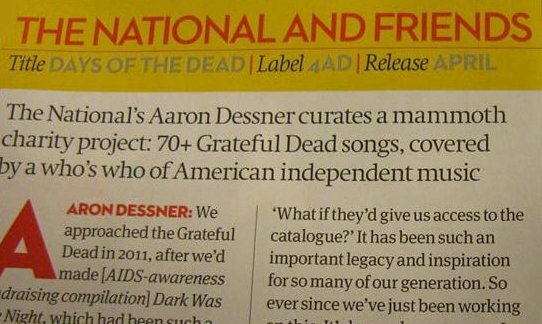 “We used to joke about starting a Dead cover band with our friends from Grizzly Bear,” Aaron explained to Relix, “so we have Daniel Rossen, Christopher Bear and Ed Droste and some of us on the full “Terrapin” suite. Bryce added some orchestration to the song because it’s this ornate, baroque, progressive rock song. It’s a more serious undertaking than just jamming out.” The collection runs nearly five and a half hours according to Hermes, and includes the Dead’s standards but doesn’t stop there. “We included songs like “Rosemary” and “What’s Become of the Baby,” Bryce revealed to Relix last year. Thanks for the details. Grateful. And thank you, for all your great posts on everything Dead!